Growing up in Colombia, I was spoiled by all the exotic tropical fruit varieties available around the country. Fruits are a very important part of Colombian cuisine and we eat them every day in a variety of ways. 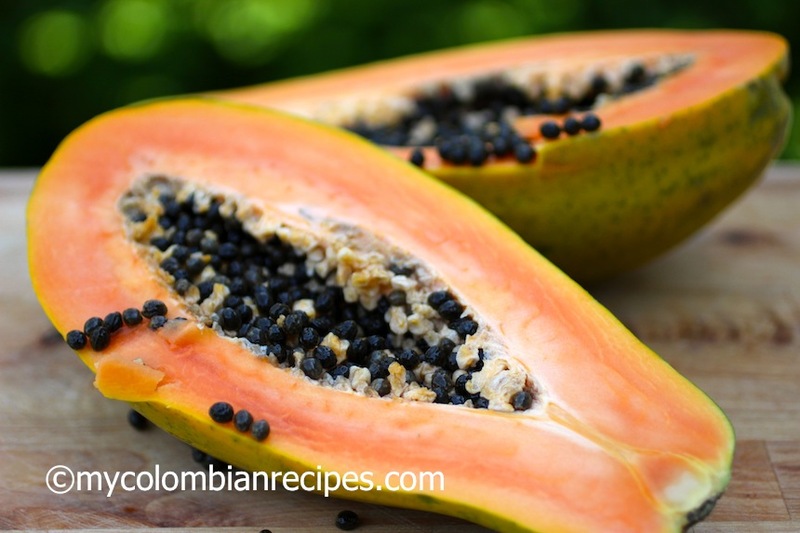 Papayas are used in Colombia to make fruit salads, smoothies, juice, savory sauces and desserts. 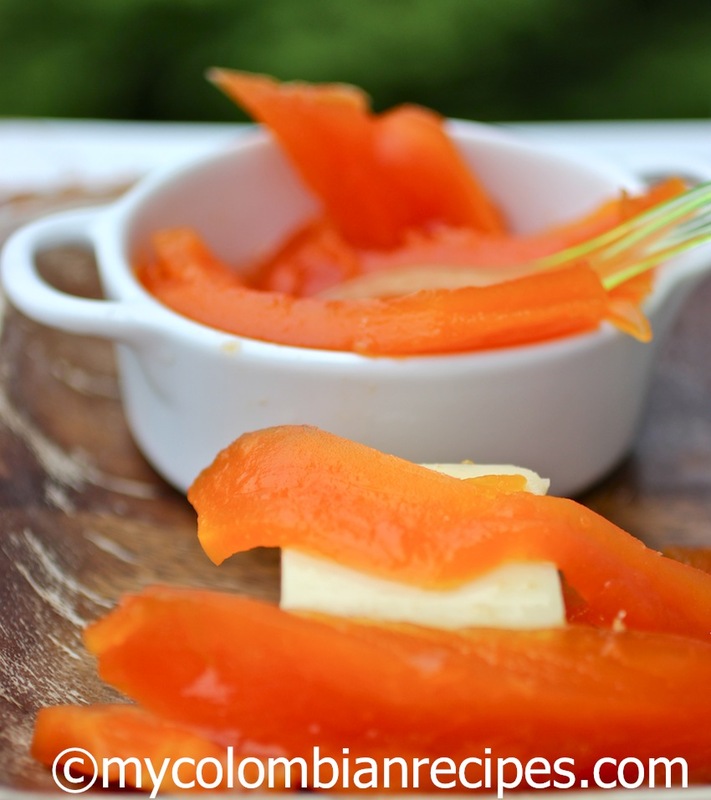 My favorite way to eat papaya, which is also one of the simplest, is to drizzle a piece of fresh papaya with lime juice. A fresh and simple treat! 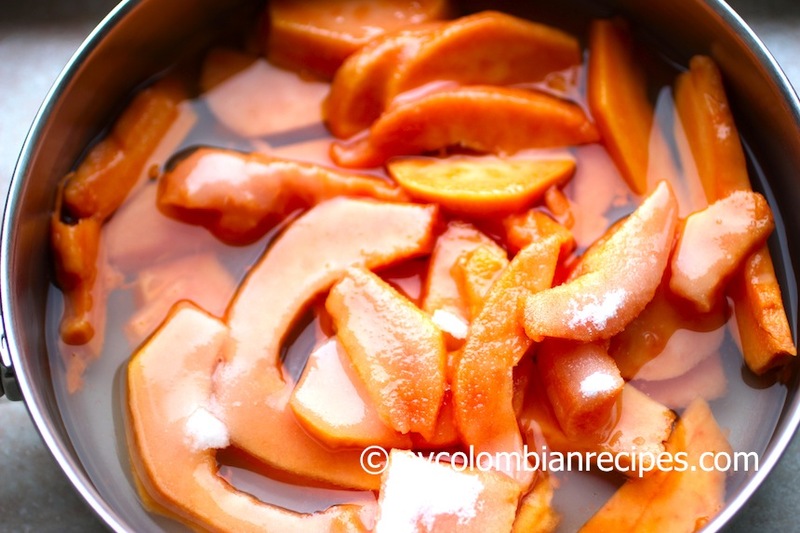 Dulce de Papaya is a traditional and a very popular dessert in Colombian homes. 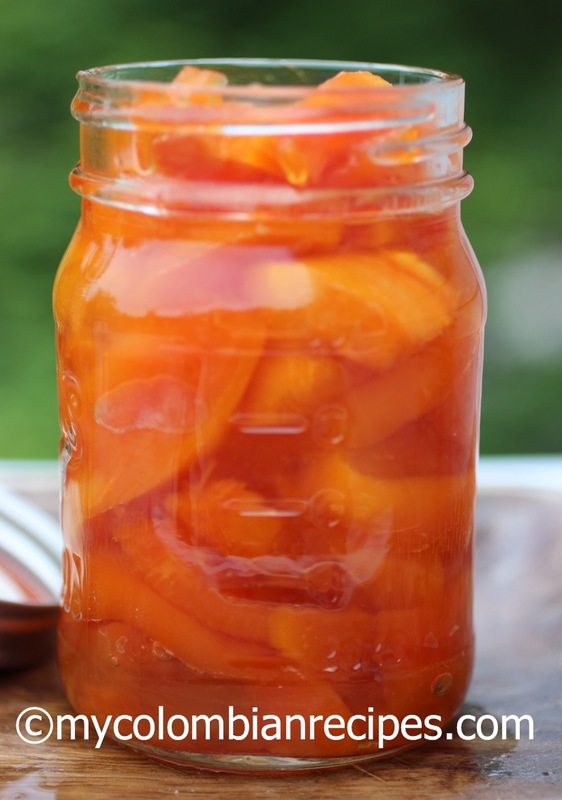 This Fresh Papaya in Syrup recipe was one of my grandmother’s favorite desserts. She loved homemade fresh fruit desserts, dulcesitos caseros, as she called them, and usually served these desserts with a slice of Colombian fresh cheese on the side. 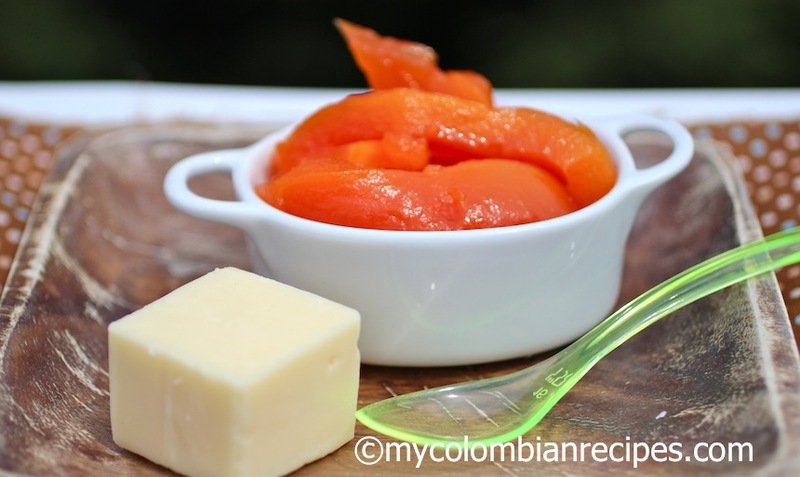 Dulce de Papaya is a wonderful addition to a cheese board, and a delicious topping for fresh warm bread or vanilla ice cream. Peel and slice the papaya. Remove all the seeds. 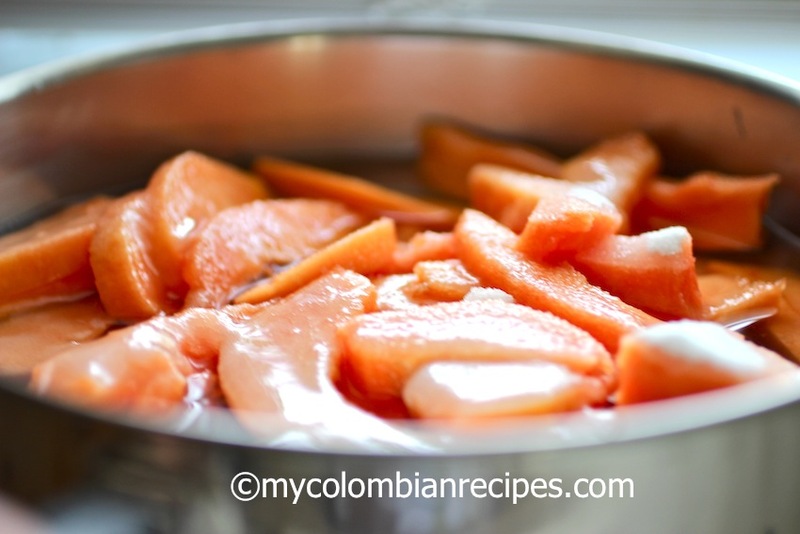 Cut the papaya into medium slices and place them in a medium pot with the sugar. Add the water and bring to a boil over medium heat, boil for about 10 minutes with the lid on. Uncover and simmer for about 30 to 40 or until the syrup thickens. Add the lime juice. Remove from heat and serve with a slice of cheese. I wish I lived where lots of exotic tropical fruits are fresh. Glad they are more common now. 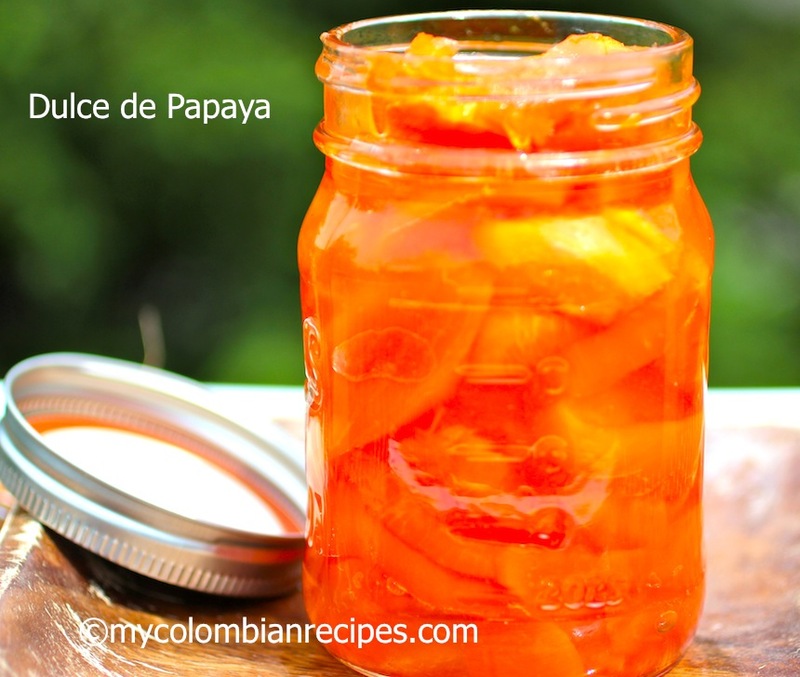 This papaya syrup sounds great. Interesting with the cheese too! Papaya is one of those fruits I can eat endlessly. 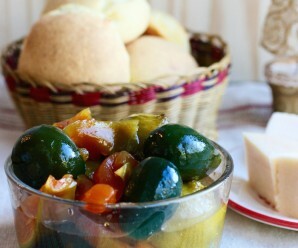 My mom would make this all the time and I have made it a few..nothing like having it with queso fresco. I am liking your pictures more and more every time you post. Love papaya! 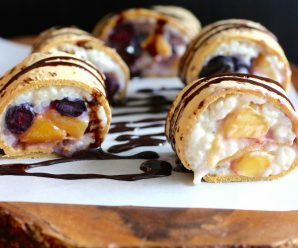 This is a fantastic dessert! Erica, this is what we call spoon sweets in Greece. It must be amazing but unfortunately papaya is not easily available in Greece. This is totally new to me. My first thought would be that I could add this to a BBQ sauce base to get a unique sweet profile on my ribs. What a perfect summery sweet treat! i can definitely imagine this spooned over some vanilla ice cream! Papaya is one of my favorite desserts. I would like to share my recipe. Choose a slightly ripe fruit. Cut it in slices of 2 inches long and 1/8inch thick aprox . Cover sliced fruit during 2 hours in 1/2 gallon of water with 1tbs of baking soda. Rinse thoroughly, remove the water, add 2 1/2cups of regular granulated sugar or light brown . I like to add 1/2 cup of orange juice instead of water, 1tsp annise seeds, 3sticks cinnamon,10 cloves of spice. Cook at medium high during 1hour or until the liquids create a light syrup and the fruit is tender. For low calories recipe add 1 cup of the Splenda Blend the kind that look like sugar and 1cup of sugar. Enjoy ! I keep it in the fridge covered in a glass container.